Newly promoted 100-year old general who was Gaza Governor supplies his formula for peace. 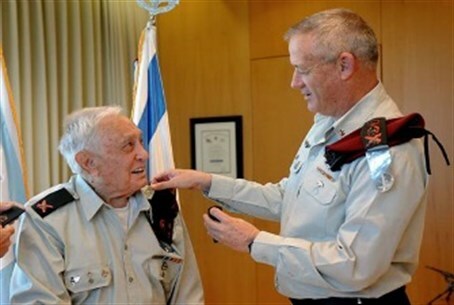 Yitzhak Pundak, who received the rank of major general Tuesday at age 100, told Channel 2 Tuesday that the way to stop the missile terror from Gaza is to use force. "Today, I can't tell the IDF what to do," he said. "But I'm sorry – we are not dealing with the Gaza Strip in the right way. In the 1970s – '71, '72 – I was governor of the Gaza Strip. In these two years the Strip calmed down completely. If they played soccer, I kicked the first ball. I presented the prize. They held 12 farewell parties for me." "Today, they fire missiles and we reply by using the Air Force against tunnels. I'm sorry... If we [choose to] sit in shelters then we will sit in shelters our whole lives. "What should be done? For every missile they fire, we reply with 20 artillery shells. If we kill 500, they'll calm down immediately. And believe me, I have a lot of experience with this. I dealt with the Arabs for five years." In a stirring ceremony on Tuesday morning, Pundak was raised to the rank of Major-General, sixty years after he was promised a promotion. He began his army service before the creation of the modern state of Israel, and was a commander in fighting on the southern front during the War of Independence. In 1953 he was made a commander of the armored corps, and in 1971 he was appointed by then-Defense Minister Moshe Dayan as Governor of Gaza, with the rank of Brigadier-General. Gaza had become a hotbed of terrorism but a tough IDF policy put an end to this situation. In the years since then, most of the credit for this tough anti-terror policy went to Ariel Sharon, but Pundak has said Sharon was trigger-happy and did not deserve the credit. In an interview on the occasion of his 100th birthday, Pundak confirmed that forces under his command razed Arab villages in 1948. “My conscience is at ease with that," he said, "because if we hadn't done so, then there would be no state by now. There would be a million more Arabs [in Israel]."